Time to join up and ban together while the rest of the world is concerned about Global Warming and Gas prices, psht. We know the real threat to our existence.. Zombies,The undead, Reanimated Corpses,Walking Cadavers, Undead Rot Stompers.. "They are coming, Are you ready???" 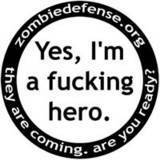 Welcome to my baby, Zombie Defense Org. We are a very new herd and just like a pandemic, we are spreading and infecting HP at an incredible rate. This is a room where thumbs are appreciated but the most important thing on the agenda is communications,planning,weaponry,statistics and idealism regarding surviving... All aircraft,Building sites,Parks,and such have full pamphlets on the " What to do if.." scenerios. I figured out of reason alone that the same should apply with the Undead. "In case of an emergency, aim for the head.."